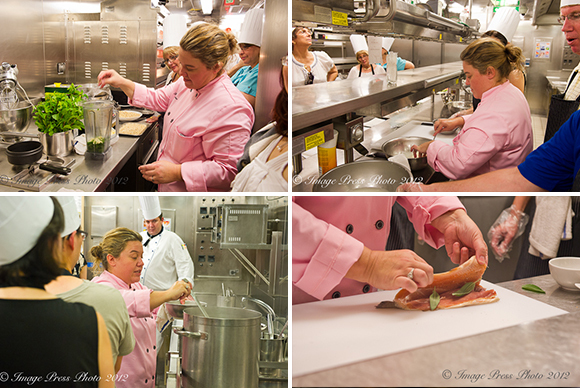 A cooking class in a ship’s galley with a well-known chef while on board a cruise ship…how much fun would that be? 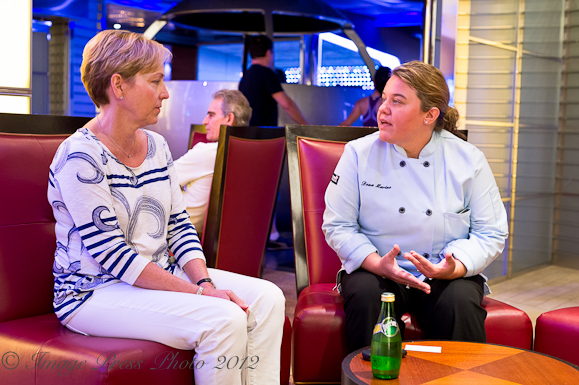 It was definitely one of the highlights of our Savor Your Destination culinary cruise in December 2011, featuring guest chef Dena Marino, on board the beautiful Celebrity Eclipse. This hands-on cooking class and lunch at Murano, one of the specialty restaurants on the Eclipse, was one of the many culinary events we attended during our week long culinary cruise with Celebrity Cruises. While some of the participants in our class were quite adept in the galley, others were there to just enjoy the great food and wine and have some fun. Assisted by Executive Sous Chef, Olivier Trividic from France, the experience was not only fun, but educational as well. 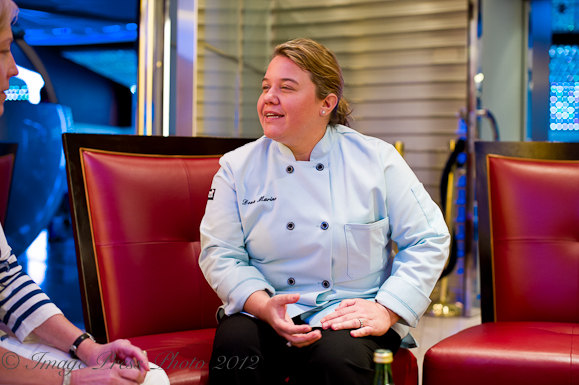 We were also able to spend time with Chef Marino on board the ship to discuss her culinary philosophy and her next exciting business venture. You can read more about her career history at the bottom of the article. Chef Marino, with her bubbly personality and passion for cooking combined with tons of energy, was the perfect host to instruct our cooking class. Our lunch menu reflected her philosophy and style of cooking; “Modern Italian Cuisine”, which combines the freshest ingredients with Old World techniques. This style of cooking originates from her Italian roots and cooking with family, but it is also inspired by her early career experience working alongside Chef Michael Chiarello as Sous Chef at Tra Vigne in Napa Valley. Modern Italian Cuisine will also be the concept at her new restaurant in the Miami Design District, MC Kitchen (opening March 2012). Marino prefers “cooking in the seasons” to “Farm to Table” and says she is truly a seasonal chef. She said, “This is not a new concept and cooking is supposed to be this way. I am sure you heard the same comment from John Besh.” She is correct. In our discussions with John Besh, he made a point that local and seasonal ingredients should be the focus and that it is about time that chefs are embracing this style of cooking. The simplicity and elegance of her cooking was evident in the dishes that we prepared in our cooking class. We prepared a beautiful fresh Idaho Trout stuffed with Parma Prosciutto and Sage that was elevated to another level with a lovely Roasted Lemon Caper Sauce. This theme was continued throughout the class with dishes like Fresh Mozzarella with Oven Dried Tomatoes, Pine Nut Pesto and Micro Arugula and beautiful fresh blanched and lightly sauteed vegetables. 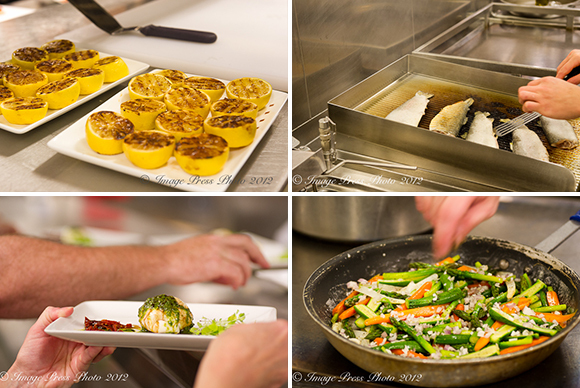 Each element of a dish was simple to prepare, yet when brought together, had incredible flavors. 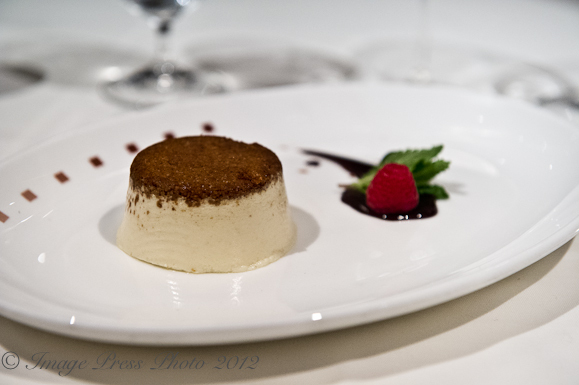 Our dessert, a Marsala Wine Semi Freddo, prepared in advance by Chef Marino, provided the perfect ending to our lunch. Beautiful website! Can’t wait to try the stuffed trout with lemon caper sauce! Love fish and this looks amazing! Looks like you both had a terrific time on board the Celebrity-Eclipse! Thank you for your comment. We had a wonderful trip and I sure wish we could go back to the Caribbean for some sunshine! We have had way too much rain in Atlanta lately! I’m still loving this cruise thing! It’s like taking a vacation through your vacation! I am glad you have enjoyed going along with us on the cruise. I am sad to say that this is the last article. I will miss reliving the trip! What a really fabulous trip and I would so love to go on one of your culinary tours! What fun! And Chef Marino sounds amazing and her cooking sounds and looks fabulous. 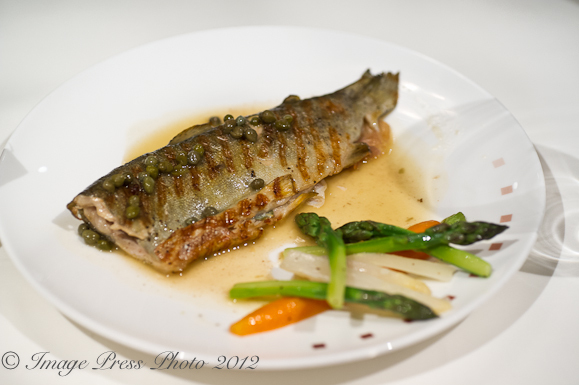 The trout is stunning with just prosciutto and sage and a light sauce? And the dessert is a wower! Great trip and great write ups. And I love the recipes. And you look so cute! Thank you for your comments. Yes, Chef Marino’s recipes were wonderful and we have a booklet from the cruise with the ones we made in the cooking class and some additional recipes. I can’t wait to try them all! I can’t believe this was the last piece on the trip. I will miss writing about it! What a wonderful experience! Your profiles are always so special… Love getting these inside looks at various chefs. And this trout recipe is something I know I’d love. Can’t wait to give it try! Thank you. Getting a chance to chat with the chefs when we travel is always a great experience. We have met some pretty incredible people over the past two years. I am so glad that you enjoy reading these articles because they are a pleasure to write. What an amazing experience to cook wih, learn from and interview Chef Marino. I completely agree with her philosophy on food. Local and seasonal ingredients – simple is best (and the most difficult, since every facet must be perfect). I love, and she must have loved Tom Passavant’s quote! To have ‘anyone’ describe you taking a dish to this level “…lifted it up on its tiptoes and makes it dance.” is awesome – that would sustain me for life! Oh, and the fact that she was a sous chef for Chiarello makes me respect her even more. With his talent and roller coaster of emotions, that requires some prety major cajones! Fantastic interview, Gwen. Felt like I experienced it myself! Thank you so much. Yes, Chef Marino is very talented and I look forward to visiting her in Miami at her new restaurant, MC Kitchen. I know that she will enjoy having access to all of the beautiful seafood and fresh produce available in Florida. I think most of us tend to discard the skin because it is not always appealing. However, when it is crispy (as it was in this dish), it was quite good with all of the flavors in the sauce. I live in the Miami area and saw an article in our trade paper about your interview of Chef Marino and her announcement that she will be opening a new restaurant in the Design District. We look forward to her new restaurant. Thank you for taking the time to read my article. 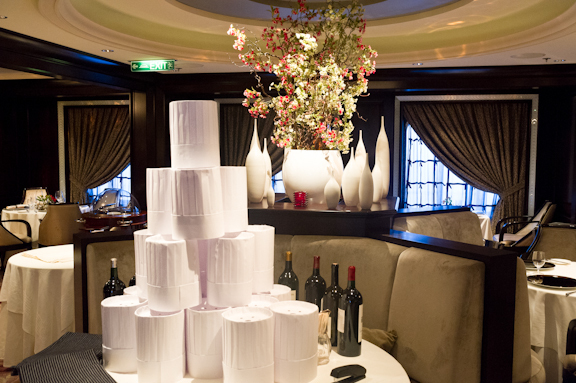 I am sure that you will love Chef Marino’s cuisine. She is also a real delight to meet! I wish we were going to have her here in Atlanta. Enjoy!